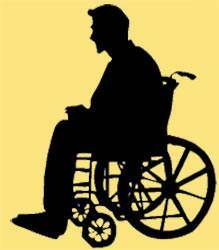 Loneliness has been called the most prevalent problem of our time. This world is filled with lonely people. A person may be surrounded by people and yet be lonely because he does not have any real friends. Why do we have such a deep need for friends? The reason is that we were made with a need for friendships and relationships. Concerning the man which He had created, God said, "It is not good that the man should be alone." (Genesis 2:18) We are social beings and we need the companionship and encouragement of friends. To feel lonely and rejected can make life almost unbearable. 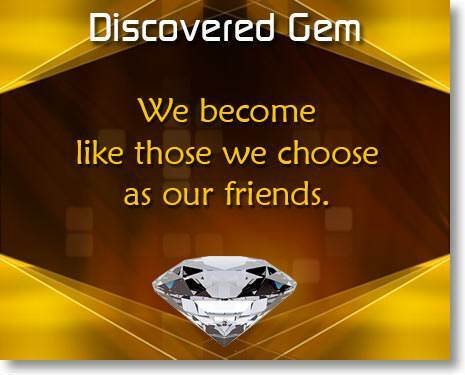 In this lesson we will learn a very important principle regarding friendships. We will learn how we can build right relationships. We are not greatly influenced by acquaintances and casual friends, but we are influenced by those we choose as our close and intimate friends. 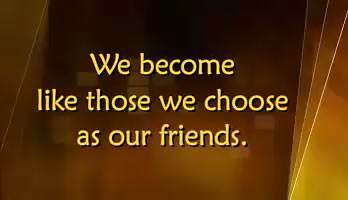 This brings us to an important principle regarding friendships: We become like those we choose as our friends. 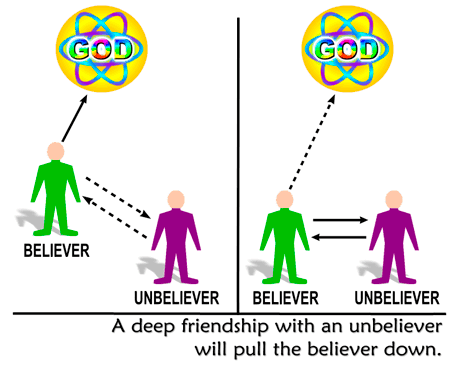 We must avoid close friendships with unbelievers. You may still love a former friend, but your aim now should be to lead him to Christ. After a time, if he continues to reject Christ, you must not maintain a close friendship with him. If you do, you will be pulled down. Once a young lady came to see the great preacher, Charles H. Spurgeon. 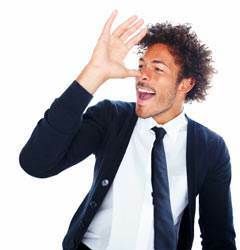 She told him of a deep friendship she had with an unbelieving young man. She said that her aim was to lead him to Christ and that she had decided to be engaged to him fairly soon. Since she was seeking his advice, Spurgeon asked the young lady to stand on a table. Then he told her to grasp his hand and try her best to pull him up onto the table. She tried, but of course could not do it. Then Spurgeon said, "Now watch what happens when I pull you." With just one pull, she came down. Spurgeon then said, "It is easy to be pulled down, but hard to pull someone up." At once the girl saw what would happen in this relationship with the unsaved man. We say again: You must not seek to maintain a deep relationship with an unsaved person. If you do, there can be but one result: You will be pulled down. We must avoid friendships with scoffers and "fools." If we want God's blessing upon our life, we should not seek or accept the advice of the wicked. We should not "stand in the pathway with sinners"—that is, we should not go to the places to which they go. And we should not "sit in the assembly of scoffers"—that is, we should not fellowship with those who make fun of the Bible and show contempt for the things of God. We must avoid friendships with those who have certain character defects. The Bible not only warns us against associating with scoffers and fools, but it also warns us against making friendships with people who have certain character defects. · The critical and discontent. Beware of making friends with those who have a bitter and critical spirit, especially those who are resentful and rebellious toward those in authority. If you associate with them, they will pass this critical spirit on to you. · The immoral. The Bible tells us to avoid associating with immoral people. (See Proverbs 7.) 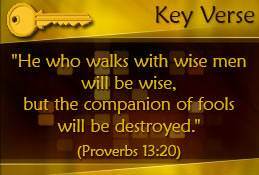 If I associate with those whose standards and conduct are contrary to God's Word, I am on the pathway to destruction. 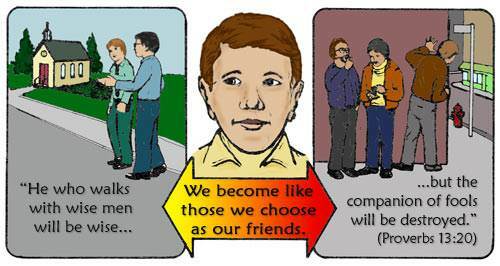 Over and over again, the Bible brings home this message: We become like those whom we choose as our friends. 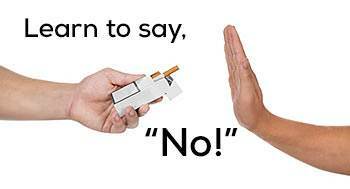 One of the most important words we can learn to say is the tiny, two letter word "No." We must learn to say it lovingly, firmly, and finally. Friend: "Come on, let's do so-and so." You: (Smile) "No, thank you." You: (Smile) "Because I have committed my life to Jesus Christ." Before Tom became a Christian, he enjoyed drinking beer with his friends in the local beer joint. Then Tom became a Christian and things were different. He no longer wanted to go to the beer joint. His friends didn't like this. They teased and nagged Tom until he gave in. Soon he was running around with his old drinking buddies again. That gave Satan the chance he was waiting for. One night Tom and his friends played "chicken." Tom lost. The car rolled over and then smashed. Tom's friends dragged him out of the back seat and stretched him out on the ground. They were too drunk to realize that they should have waited for the medics to move him. Tom's back was broken just below the neck. He spent many days in the hospital with heavy weights on his hips, legs, and arms. Tortuous days and long dreary nights followed each other in weary succession. Now Tom uses a wheelchair to get around. He will never walk again. He has artificial limbs to try to take the place of the hands that are there but unable to function. We have seen how the wrong kind of friends can influence us in the wrong way. It is also true that the right kind of friends can influence us for good. But how do we get the right kind of friends? We tend to think that having the right kind of friend depends on our meeting the right kind of person. But God's Word shows us that it depends more on our being the right kind of person. In other words, to have the right kind of friend, I must be the right kind of friend. Let us consider now the qualities we want and need in a true friend. As we consider each of these qualities, let us ask ourselves, "Am I this kind of person? Do I have this quality in my life?" · I need a friend who loves the Lord Jesus. · I need a friend who loves and accepts me. When we have a friend who loves and accepts us just as we are, it sets us free to enjoy the relationship. To have this kind of friend, I must be this kind of friend. · I need a friend who shares my burdens. · I need a friend who is loyal to me. One of the marks of a true friend is that he is there when you need him. You can count on him. Am I this kind of person? · I need a friend who encourages. We all need encouragement. Someone has said, "We live by encouragement and die without it, slowly, sadly, and angrily." Do I encourage others? · I need a friend who is trustworthy. A solid friendship is based on mutual trust and confidence. If I want a friend whom I can trust, I must be trustworthy. · I need a friend who is honest with me. · I need a friend who is thoughtful of me. Thoughtfulness is a quality that we appreciate in others. Likewise, we may be sure that others appreciate this quality in us. Am I thoughtful of others? We have seen the qualities that we need in a friend. 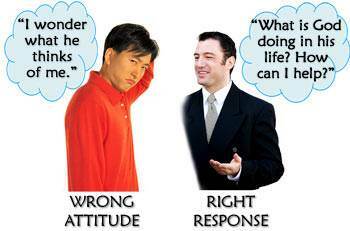 Now let us consider the attitudes on our part that will help us build right relationships. If I have not accepted myself, I will find it difficult to have friends and to share my faith with others. To accept myself does not mean that I believe I am all I want to be or should be. It simply means that I see myself as a worthwhile person, created by God, redeemed by God, and precious to God. As I learn to think this way about myself, I will be able to accept others and to express God's love to them. Everyone has the deep, inner need of being accepted. Showing others by my attitude and actions that I accept them opens the way for them to accept me. "I believe that you are valuable." One reason why people were attracted to Jesus was that He valued them. He did not consider any person to be unimportant. He saw every person as a special creation of God and exceedingly precious to Him. "I will express God's love toward you." Love is the foundation upon which friendships are built. Whomever we meet, we can be sure that God loves them and that He wants us to express His love to them. "I am interested in you." You will make more friends by becoming genuinely interested in other people than you can ever make by trying to get other people interested in you. If we are constantly thinking about ourselves and what others think of us, we become uncomfortable and self-conscious around people. We need to ask God to set us free from ourselves so that we can reach out to other people with love and sincere interest. If your attitude needs changing, you can change it with God's help. One way we show people that we care about them is by listening to them. A vital part of a good relationship is being able to share burdens and seek solutions to problems. This requires listening carefully without interrupting. It is important that we develop this ability. Poor listeners do not make good friends. "I will treat you as I want to be treated." You need at least a few close friends you can depend on. If you do not have them, ask God to direct you to those whom He would like to be your friends. Make it your purpose to be a true friend to them. As you do, you will find that they will become your true friends. As we choose our friends, our main concern should be that those who will most deeply affect us are those who know and obey the Lord Jesus. The strongest and most lasting friendship between two people is one in which both are growing spiritually and are intent on following God and doing His will. 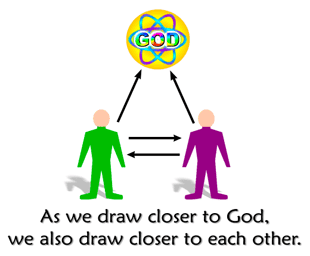 As both friends draw closer to God, they draw closer to each other.